Pincushion proteas (Leucospermum) count as some of the most popular members of the Protea family (Proteaceae) for cut-flowers. However, there are a number of members of the genus Leucospermum that will never find their way into a cut-flower bouquet. 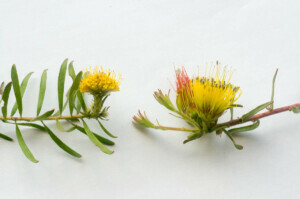 This is because their stems are weak and trailing and their flowers small. However, they lack none of the charm of their larger cousins. 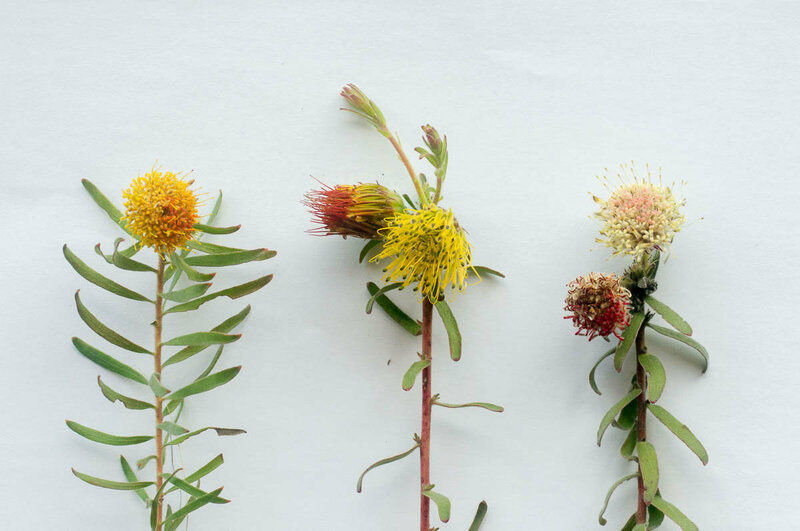 At Phillipskop we have three of these low-growing pincushion proteas: Leucospermum prostratum, Leucospermum gracilis and Leucospermum pedunculatum. 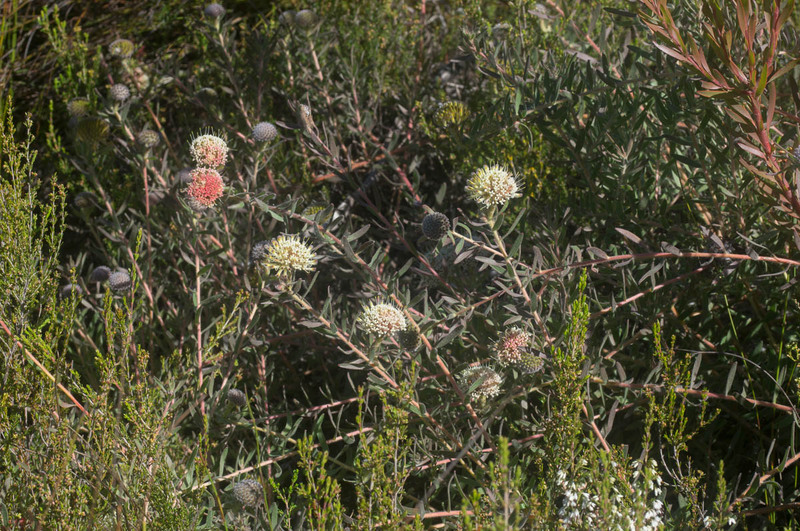 Leucospermum prostratum is the one that visitors to the reserve are most likely to come across. 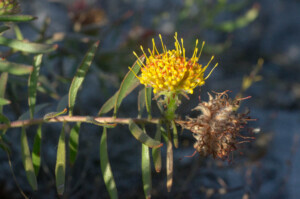 It grows in the deep eroded sands on the lower slopes of Phillipskop near the start of the hiking trails. It is the smallest of the three, with domed heads of yellow flowers that age to orange. The name “prostratum” is very apposite, meaning prostrate. The plants send out trailing stems from a central underground bole and while the plants are rarely more than 20cm high they can be very wide in diameter. Unlike the other two species at Phillipskop, the plants survive fire by resprouting from their underground stem. One of the good features of Leucospermum prostratum is that flowers can be found at almost any time of the year. It is therefore one of the few proteas that is still in flower in the heat of summer. 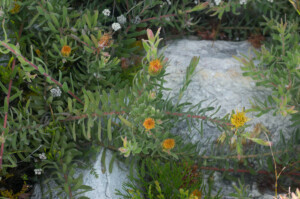 Leucospermum prostratum is found through the Klein River Mountains, as well as Kogelberg and surrounding mountains, Caledon Swartberg and Elim flats. Due to its propensity to grow on the lower slopes, which are often developed, it is considered a vulnerable species from a conservation point of view. 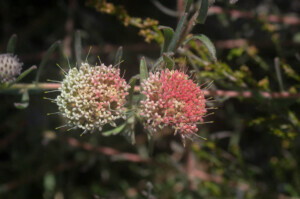 The other two trailing pincushion species are found higher up the slopes of Phillipskop, where they can even be found growing side-by-side. 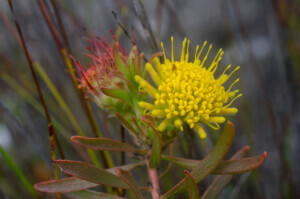 Leucospermum gracile is often known as the Hermanus pincushion due to its limited distribution along the Klein River Mountains, Babylons Tower and mountains south to Bredasdorp. At first glance it can look very similar to Leucospermum prostratum. It too has yellow flowers that fade to orange but they are larger and while Leucospermum prostratum is domed in its side view, Leucospermum gracile has a flat-topped profile. Leucospermum gracile grows on the steep rocky slopes on the southern side of Phillipskop peak. 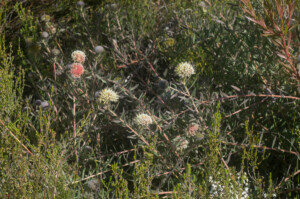 The third species is Leucospermum pedunculatum. This species has creamier white flowers that fade to pink. The flowers are about the same size as Leucospermum gracile, but have the domed profile of Leucospermum prostratum. 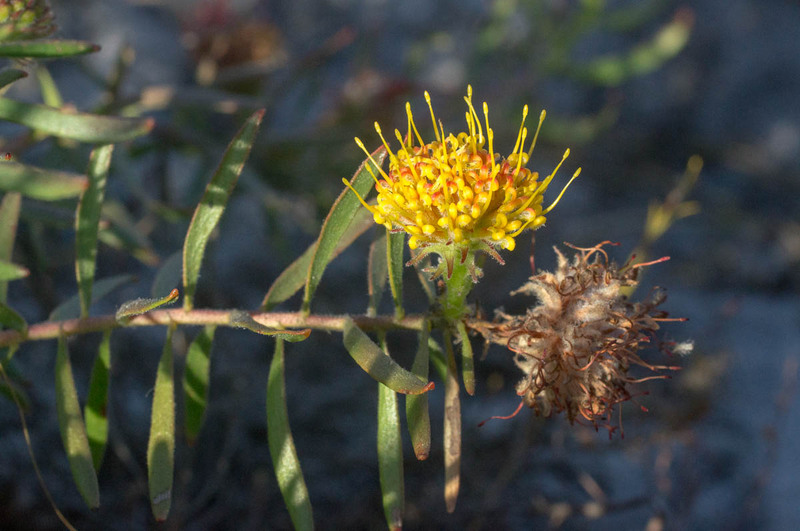 Both Leucospermum gracile and Leucospermum pedunculatum only survive fire as seeds and form looser bushes with more vigorous stems that often project upwards amongst the surrounding fynbos. 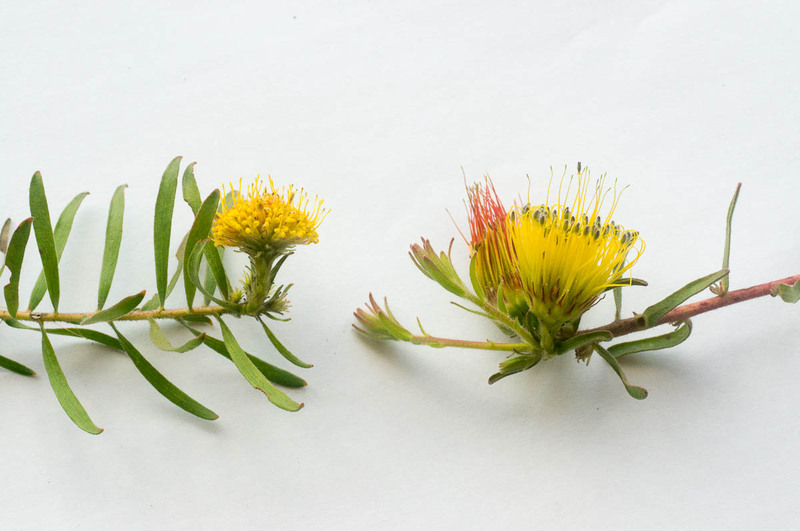 These two species also have a shorter flowering time than Leucospermum prostratum, mainly October to December. Leucospermum pedunculatum is generally a lowland species of the Elim area and towards the coast, but reaches as far north as the Klein River Mountains, where it grows much higher up, at around 400m (look for plants near the Saddle at Phillipskop). 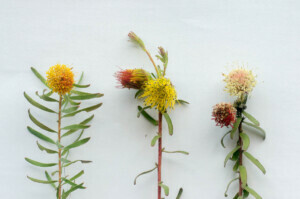 These are the only three trailing species of pincushion protea in the Klein River Mountains, from Fernkloof Nature Reserve and Vogelgat to Phillipskop, and are easily distinguishable once the basic features are recognised. December, January, Leucospermum, Leucospermum gracile, Leucospermum pedunculatum, Leucospermum prostratum, November, October, Proteaceae, Spring, summer. Bookmark.